Larry Greer is a theatre artist who has worked as an actor, director, and instructor in the Kansas City area since 1987. Larry has performed on every professional stage in Kansas City, including The Missouri Rep, The Unicorn, Heart of America Shakespeare Festival, and The New Theatre. As a director, Larry’s work has been seen on educational, community, and professional stages. His early fascination with both Lincoln and the Civil War led to this program. 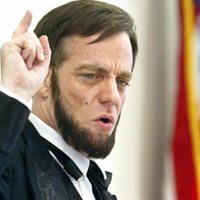 Larry’s presentation of The Living Abe Lincoln has been performed for tens of thousands of students at hundreds of schools throughout the Kansas City area, St. Louis, and New England. He thanks you for the opportunity to bring this compelling figure from our history to life.